Meek Mill was released from prison today after The Philadelphia Supreme Court ordered the rapper to be released on bail. Upon his release, the Philadelphia star issued a lengthy statement about his ongoing case and his love and support from fans. “I’d like to thank God, my family, my friends, my attorneys, my team at Roc Nation including JAY-Z, Desiree Perez, my good friend Michael Rubin, my fans, The Pennsylvania Supreme Court, and all my public advocates for their love, support and encouragement during this difficult time. He went on to say that he hopes to make a difference in others’ lives moving forward. “Although I’m blessed to have the resources to fight this unjust situation, I understand that many people of color across the country don’t have that luxury and I plan to use my platform to shine a light on those issues,” he said. 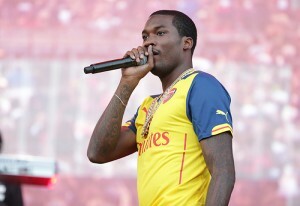 Meek was released and hopped straight on a helicopter to freshen up and receive a standing ovation at the Sixers game! Other celebrities have shared their support and excitement for the Maybach Music Group star. T.I shared a phone call between the two after his release. He’s right! Welcome home Meek! We’re excited to watch the bounce back! It’s sure to be better than ever!